On Sunday 1 April the Royal Air Force will turn 100! 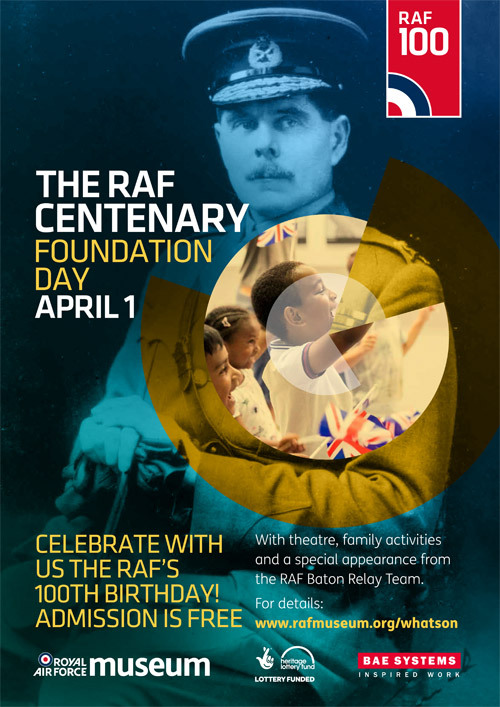 The RAF Museum will be sharing and celebrating RAF stories throughout the year, but you can join us to commemorate this very special birthday with theatre, family activities and a special appearance from the RAF Baton Relay team. Our NEW restaurant, Claude's, will be serving traditional Sunday Fayre so you can enjoy a fantastic day out and a delicious meal with the whole family. There might even be a birthday cake, after all it's not every day the Royal Air Force turns 100! On the 1 of April 1918 the Royal Air Force and the Women’s Royal Air Force was formed in the midst of the First World War. Join us to hear the voices of the men and women that are part of the RAF story. Front of House Theatre company will be breathing life into these amazing stories set amongst our First World War Exhibition. Serving RAF personnel will carry the Baton across the country and around the world, visiting 100 locations in 100 days. We are lucky enough to share in the first part of the journey. The team will be running from central London to the RAF Museum in Colindale. Come and cheer them on, show your support and help them commemorate and celebrate a century of the RAF and inspire future generations. Try on our flying jackets and uniforms and pose in front of our amazing aircraft. Hear about the historic airfield underneath your feet and the history of Aviation in Hendon. Colour in your own flag to celebrate the Centenary of the RAF. This event will form part of a series taking place across the country celebrating and commemorating the history and achievements of the Royal Air Force and inspiring young people. For more information on RAF100 activities please click here.